Why can Professor Xavier walk in Secret Wars? In Secret Wars #1, Professor Xavier is transported to Battleworld with his wheelchair, and Mr. Fantastic states in issue #3 that he wasn't originally in it (I assume he was in bed or something). Mr. Fantastic: Professor X said he wasn't in his wheelchair when he disappeared, though he arrived here in it! It's as though the Beyonder "fixed" little things that seemed to be wrong, or missing! Yet after issue #1, he's walking around with his wheelchair nowhere in sight. Spider-Man even comments on it. 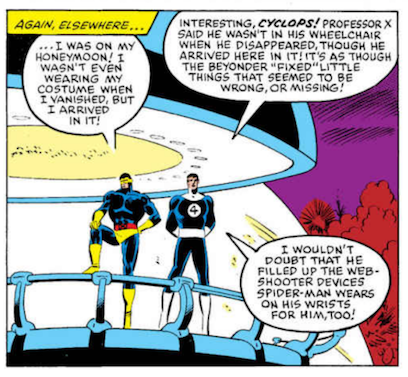 Spider-Man: (Thinking) Boy, it's still weird seeing Professor Xavier not in a wheelchair--! How is Professor Xavier able to walk? Did I miss something in Secret Wars? Or was something going on in the X-Men series at the time that made him able to walk? According to this site, he overcame the mental block (his legs had been repaired some time before) in the issues right before Secret Wars. Although Professor X theoretically has had the ability to walk for some time now, it was only in the issues of X-Men and New Mutants that took place directly before Secret Wars that he was able to overcome the mental blocks and actually start walking without pain. Additionally, while Storm has been the leader of the field team, the X-Men's first and greatest field leader Cyclops is back in the picture for this series. So there's a lot of debate about who should be leading the team. According to the Marvel wiki entry, his body was restored (mind transferred into a newer, younger, clone body) in Uncanny X-Men #167. Between #171-175, he attempted to walk, but felt intense pain when he tried to use his legs. New Mutants #14 is where he is first shown walking, with the reveal apparently being him getting up to dance with Illyana after she defeated S'ym. In Issue #180, we see him walking and playing basketball before is abducted to Battleworld at the end. After months of practice, Charles Xavier has managed to beat the psychosomatic feedback his mental powers had created preventing him from walking in his new body. He decides to enjoy this newly acquired ability to playing basket ball. Not the answer you're looking for? Browse other questions tagged marvel comics x-men secret-wars or ask your own question. How can Professor Xavier be alive? How did Secret Wars fit into regular comics continuity? Do any of the Secret Wars (2015) tie-in stories spoil the main Secret Wars story? What is the reading order for the 2015 Secret Wars event? Did every Marvel Universe title reset numbering after Secret Wars?